My French may have deteriorated a bit since I lived in Paris, but my love for the simple classics has not. 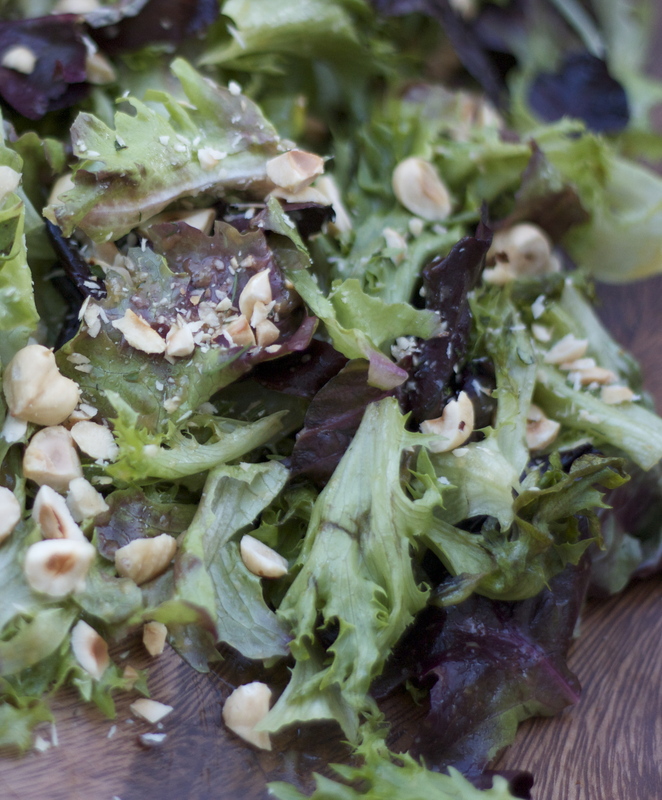 A nice buttery lettuce mix, mustard vinaigrette (I like 2 parts vinegar of choice, 10 parts oil of choice, 1 part Dijon mustard with a dash of pepper and salt) and freshly toasted hazelnuts are the perfect start or finish for any outdoor meal. The thyme on my patio is in full bloom. Taking advantage of the sweet blossoms and baked/grilled baby potatoes from last night’s asado, I scoop out the insides and mixed them with with three tbsp of thick yogurt and one tbsp of pumpkin oil, whipping with a fork. 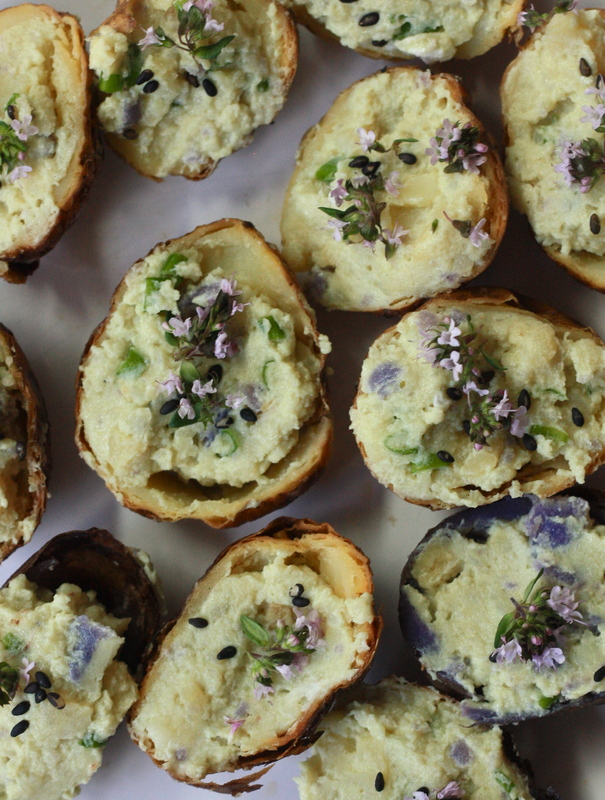 I spoon the mixture back into each potato skin, topped with a few black sesame seeds and fresh thyme blossoms. Sweet home Chicago. I’m here for a week and fortunate enough to catch up with old friends. One of my best friends is Polish, and a very good cook. She’s prepared a Chicago size batch (that means a lot) of classic potato and farmer’s cheese pierogi. She quickly boils the “little pillows from Heaven” (my translation, not the actual Polish meaning), then tosses them in butter and caramelized onions she made beforehand. The fresh dough has a little bite, the potatoes and cheese are inside are combined into a perfectly smooth union: I can’t tell where one begins and the other ends. The filling-to-dough ratio is sinful with an appearance of a freshly fluffed pillow, and the caramelized onions are only sweet an aromatic. Nothing frozen tastes this good.